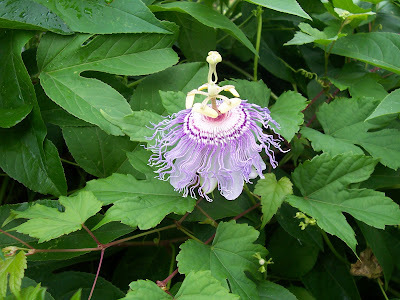 PASSION-Flower. Of this genus there are no less than thirty-seven different species. 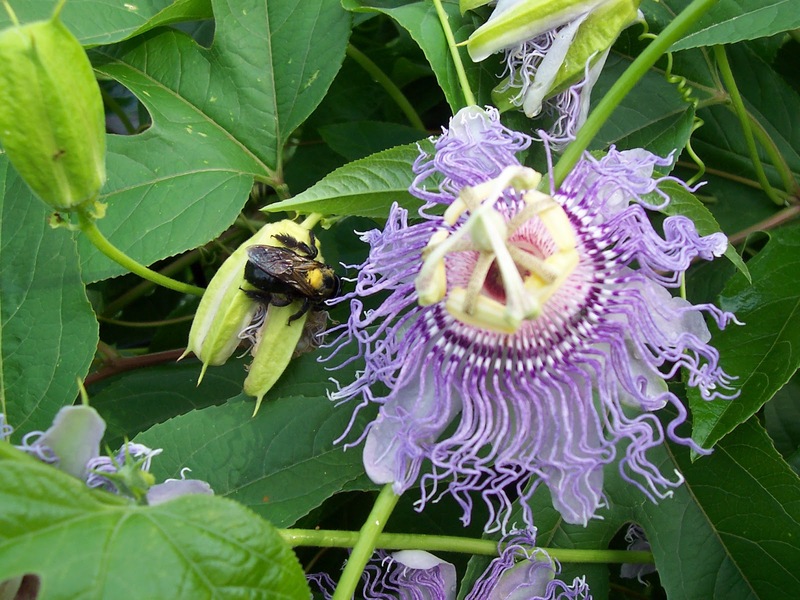 This is the common blue Passion- flower, which in a few years may be trained up to more than forty feet high, and the stalks grow to a very considerable size. It grows naturally in Brazil, but is hardy enough to thrive here in the open air, and is now become the most common species in England. 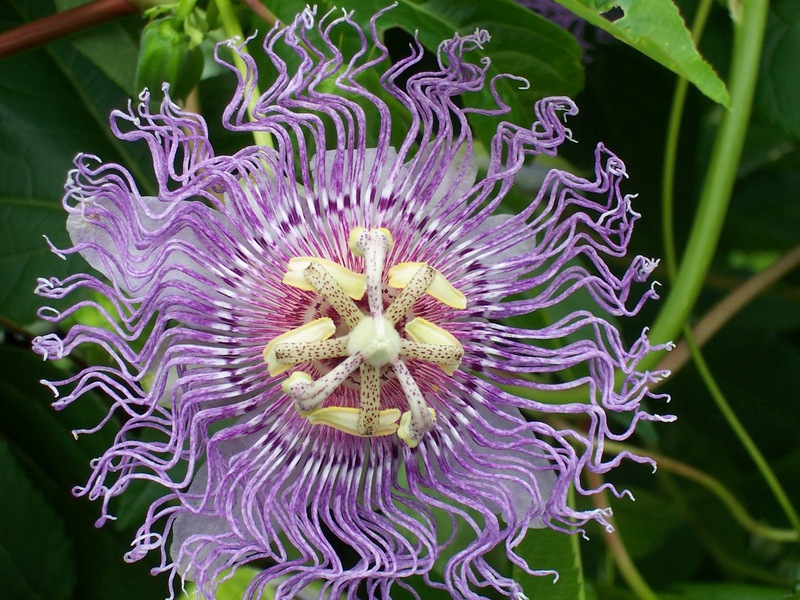 This beautiful tribe of plants was unknown until the discovery of America, and the different species are chiefly found in South America and the islands. It has its name from a fanciful analogy of the different parts of the flower to the Passion of Christ. The Jesuits, who went as missionaries to South America, though they discovered in the three pistilla the representation of the three nails with which our Saviour was nailed to the Cross; the five stamina the five wounds; and the radiant purple Nectary the representation of the rays that might be supposed to have surrounded his head when he expired on the Cross. Duppa, Richard. 1809. 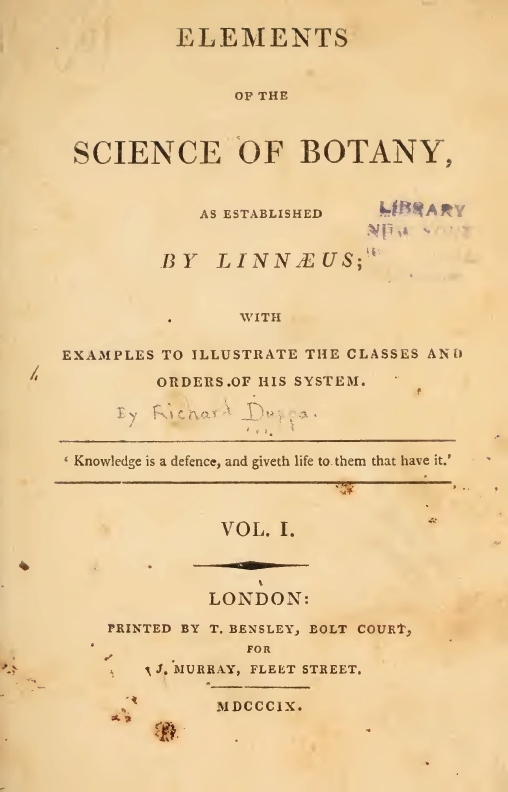 Elements of the Science of Botany, as established by Linnaeus with examples to illustrate the classes and orders of his system, Vol. 1. London: T. Bensley, Bolt Court for J. Murray, Fleet Street: 27-28. 1. P. lutea, L. Smooth, slender; leaves obtusely 3-lobed at the summit, the lobes entire; petioles glandless; flowers greenish-yellow (1' broad). 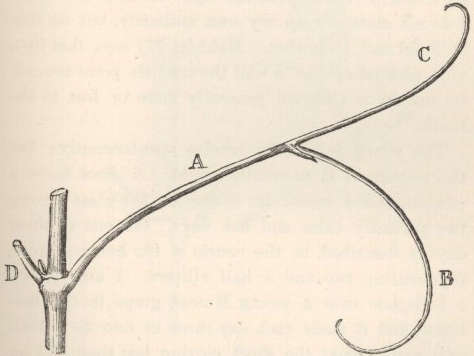 — Damp thickets, S. Penn. to Ill. and southward. July -Sept. — Fruit 1/2' in diameter. 2. P. incarnata, L. Nearly smooth ; leaves 3-cleft ; the lobes serrate ; petiole bearing 2 glands; flower large (2' broad), nearly white, with a tripil purple and flesh-colored crown; involucre 3-leavcd. — Dry soil, Virginia, Kentucky, and southward. May - July. — Fruit of the size of a hen's egg, oval, called Maypops. 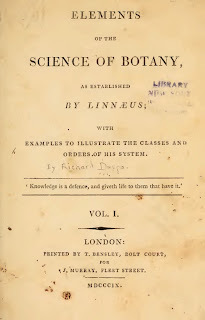 Asa Gray, Manual of the botany of the northern United States : including the district east of the Mississippi and north of North Carolina and Tennessee, arranged according to the natural system. New York : Ivison, Phinney, Blakeman, 1867, p. 185-186.
de Beer, Gavin ed. 1960. Darwin's notebooks on transmutation of species. Part III. Third notebook [D] (July 15 to October 2nd 1838). Bulletin of the British Museum (Natural History). Historical Series 2 (4) (July):119-150. NOTE: See David Kohn in Barrett, Paul H., Gautrey, Peter J., Herbert, Sandra, Kohn, David, Smith, Sydney eds. 1987. Charles Darwin's notebooks, 1836-1844 : Geology, transmutation of species, metaphysical enquiries. British Museum (Natural History); Cambridge: Cambridge University Press. [page] 251 CHAP. VIII. STERILITY. 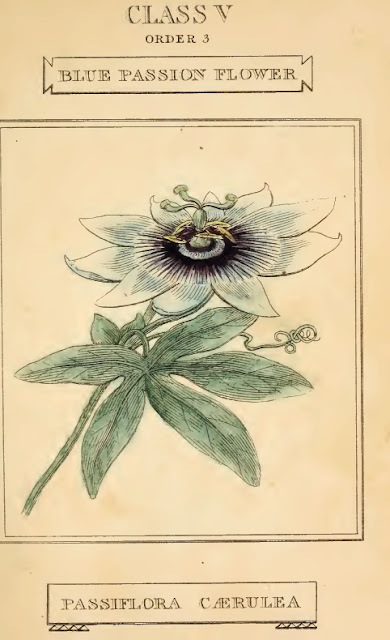 few days perished entirely, whereas the pod impregnated by the pollen of the hybrid made vigorous growth and rapid progress to maturity, and bore good seed, which vegetated freely." In a letter to me, in 1839, Mr. Herbert told me that he had then tried the experiment during five years, and he continued to try it during several subsequent years, and always with the same result. 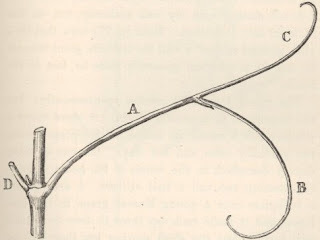 This result has, also, been confirmed by other observers in the case of Hippeastrum with its sub-genera, and in the case of some other genera, as Lobelia, Passiflora and Verbascum. 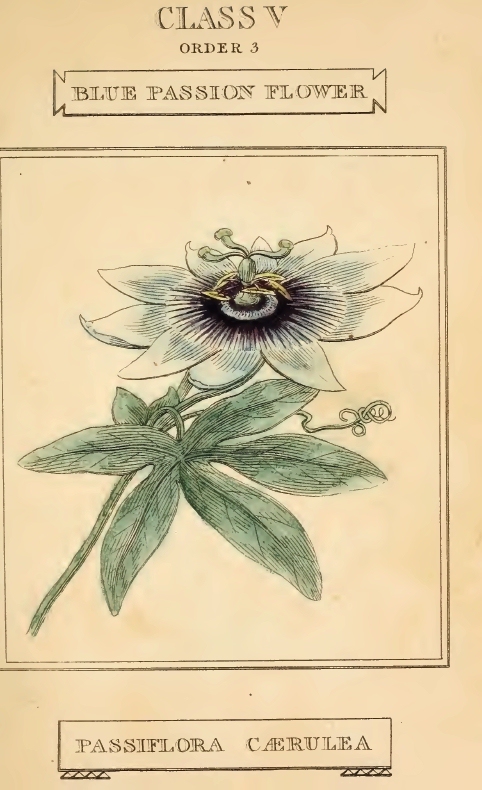 Although the plants in these experiments appeared perfectly healthy, and although both the ovules and pollen of the same flower were perfectly good with respect to other species, yet as they were functionally imperfect in their mutual self-action, we must infer that the plants were in an unnatural state. Nevertheless these facts show on what slight and mysterious causes the lesser or greater fertility of species when crossed, in comparison with the same species when self-fertilised, sometimes depends. Darwin, C. R. 1859. On the origin of species by means of natural selection, or the preservation of favoured races in the struggle for life. London: John Murray. 1st edition, 1st issue.